Are you a manufacturing voter? On November 4 you have an opportunity to vote for candidates and issues likely to help grow our economy's most important sector. 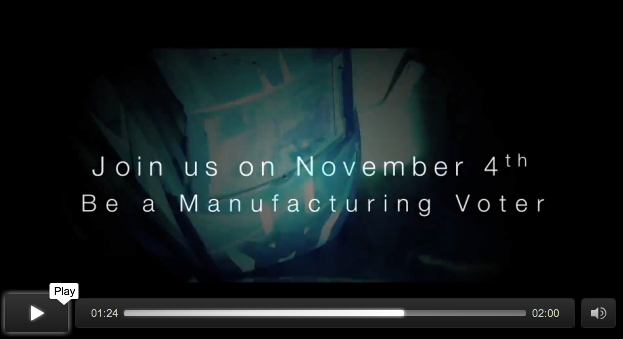 We invite you to watch and distribute this National Association of Manufacturers (NAM) video and vote manufacturing on election day! Below are also CMTA's ballot positions as well as a link to the NAM's Election Center. CMTA has taken the following positions on initatives (here's why) and we invite you to look at NAM's election center for Congressional information. Proposition 1 Support Water Bond: Funding for Water Supply, Treatment, and Storage Projects. Proposition 2 Support Rainy Day Fund: State Budget. Budget Stabilization Account. Proposition 45 Oppose Healthcare Insurance. Rate Change Approval. Proposition 47 No Position Criminal Sentences. Misdemeanor Penalties. Proposition 48 No Position Indian Gaming Compacts.